On 28 May 2018 the monsoon officially started in Yangon, Myanmar. At this same date, the project MyVAS4Agri was launched by the project partners all present in Myanmar. According to Burmese traditions, this will bring fortune and luck to our project. MyVAS4Agri, an acronym for “Myanmar Value Added Services for Agriculture”, is a G4AW project funded in the 3rd call. 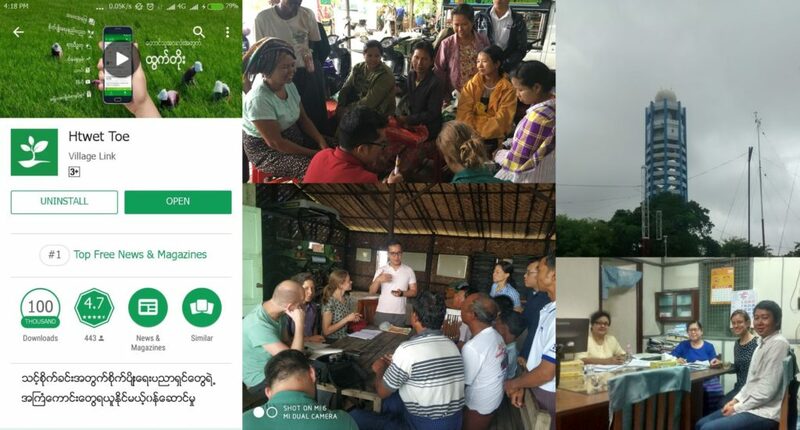 The project partners are agro-supplier AWBA group, software developer Miaki, their joint venture VillageLink, the Myanmar ministry of agriculture and three Dutch partners being TerraSphere, Sarvision and Weather Impact. The coming years we will work towards successful implementation of weather and satellite data in information services for farmers. During the project we aim to reach at least 850,000 small scale farmers. The project has a jump start with the “Htwet Toe” mobile app. Htwet Toe means high yield, and provides farmers with all sorts of relevant information, ranging from farm-advice via questions and answer to weather information to market prices. This mobile app was developed by Village Link and already has more than 100,000 downloads form the google play store. After having many fruitful interviews with local farmers and agronomists, Weather Impact is looking forward to enriching the Htwet Toe app with tailored weather-related farm advisories, seasonal outlooks and monitoring and advanced forecasts on onset and cessation of the monsoon.